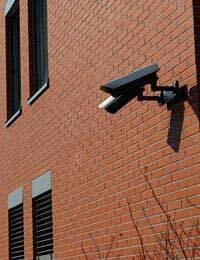 Home > Ask Our Experts > What Can we do About a Neighbour's CCTV Camera? I was wondering what action I can take with regards to a neighbour who has just recently moved a CCTV camera into his bedroom and is pointing it directly at our front door and two bathroom windows. We live in a courtyard development (5 houses) and the camera is about 10-15 metres away and clearly visible. He already has an external camera pointing towards his own door which is absolutely of no consequence, but I feel the second camera is in violation of our rights to privacy. We have recently had some flooding issues, although his property was not affected. The emergency services were called and he was seen standing watching everyone and even the fire brigade felt the need to comment. Later that day when council representatives were on site, in front of witnesses he "flew" at my wife and invaded her space and verbally attacked her. What can I do? The main laws surrounding the use Of CCTV are contained within the Data Protection Act 1998 but these do not cover domestic residences. It is perfectly legal for a resident to install CCTV (even with recording and playback capabilities) and, in the normal course of events, this will be done to protect one’s own property against the threat of intruders and trespassers. When installed correctly and used for the right purpose, residents who have installed CCTV will tend to have a positive effect on the reduction of crime and anti-social behaviour occurring in the neighbourhood, as would be perpetrators of such actions would be less inclined to commit offences for fear of being caught on camera. The problem, as you rightly pointed out, lies in the fact that you perceive that one of your neighbours’ CCTV cameras is pointing directly at your property and this is a Privacy Issue. As far as the law goes in this regard, it would be covered by the Human Rights Act under your rights to privacy. Article 8 of the Act entitled “The Right to Respect for Private and Family Life, Home and Correspondence” means that your neighbour might well be breaking the law here. Ideally, it would be better if you could speak to the neighbours politely, explain the situation to them and request that they make certain modifications to the CCTV system so that it does not infringe on your privacy. However, given you stated that the man verbally attacked your wife, the likelihood would seem to suggest that he would not be prepared to listen. Incidentally, the fact that the man verbally attacked your wife might be also covered under the Human Rights Act in terms of harassment alone. It's also likely that his behaviour will have been mentally noted, at least, by the council representatives so that could obviously go in your favour. Therefore, I think you have every right to contact your local authority or local police force and have them come out to investigate. They would obviously need to be satisfied that the installation was basically Causing Harassment, perhaps even bordering on voyeurism, and they could then take action. Alternatively, get some advice first from a solicitor who has specialist knowledge in this area. Hi, I have a right of way over my neighbours driveway that allows for unlimited crossings on either foot or vehicle. The neighbours have recently installed a cctv camera which watches us as we use the right of way. They are watching everyone who visits us and us every time we leave the house. What are my rights regarding this? My neighbours have verbally abused me for years and just recently it has turned physical which the police are currently investigating. I put a camera up inside my house that shows my drive way and cars and the path way and some of the road outside the front of my house none of there property. The reason for this is I'm worried they may vandalise my car etc as I've been complaining to the council and reporting them to the police. Every time I step out my front door there in the windows watching my every move. I've had enough of being made to feel uncomfortable so I put a 6ft fence between my house and there's (semi detatached) they complained tried to get the council to make me take it down but I have permission so I've been allowed to keep it up. I've came home tonight and noticed they have a camera in there upstairs bedroom window pointing straight on my drive way and property. So because I've stopped them spying by putting the fence up they have now done this. Is there anything I can do please? Any advise would be brilliant thanks. My neighbour has cctv cameras on his house.One is pointing over the fence into my back garden and another camera is pointing at my drive and the front of my house.I contacted the police who came round and agreed that the cameras appeared to be pointing at my property.They went round to the neighbour who pretended he wasn't at home.They have tried several more times, but without success as my neighbour will not allow them into his property to view his cctv monitor.What can I do? My neighbour has just installed a "device" which seems to have a lens and in low light conditions has 2 red lights on it. This device is supposed to be guarding their oil tank from intruders. Unfortunately their oil tank is only about 1 foot away from my sitting room wall , so the device is directed at my wall. This wall of this sitting room is only 4 foot high , with a sloping ceiling. The ceiling has a velux window, located just above the oil tank. Consequently, the device appears to be looking into my room . It just so happens that I usually sit under this velux window. so possibly this device can see me sitting in my room. My problem is 1. I do not know what this device is. I happened to see a man installing it ( unmarked van) I asked him what it was and all he would tell me was that it was to guard the tank. I cannot ask my neighbour directly as I am in the midst of a noise dispute with him ( me complaining). So how can I tell if it is a camera or something else? 2. If it is a camera, is there anyway I can find out whether (possibly inadvertently) it can see into my room? 3. If it can see into my room is there anything I can do? My next door neighbour has bought the other house at the other side of us. He has installed a cctv camera at the top of the garden looking at his new property.Not sure if it catches ours but the bathroom window is on that side. Also he has put a camera on a wall facing up the shared path that crosses our back yard. I let the dog out at night. The camera turned blue and heard a voice saying what you looking at??? Is this 1 illegal? I have a cctv camera that can move 360 degrees and I have it pointed down my drive and I make a point of not moving the camera over to any of my neighbours areas but one of my neighbours has complained about the camera breaching her human rights. So my question is where do I stand legally? My neighbour has his drive fenced in by large wooden gates - he has a short drive that leads up to his gates that is parallel to my drive which is open and not fenced in. He has put up cctv cameras on the outside of his gates which he says is to monitor his short drive, but in reality the cameras are pointing at my open plan drive and side on to my front door so that he can see my every move - is there anything I can do about this? Ask if you can look at the footage to see where the camera is focused? If you're not happy then get your local police to have a word with the neighbour. My neighbour has his drive fenced in by large wooden gates - he has a short drive that leads up to his gates that is parallel to my drive which is open and not fenced in.He has put up cctv cameras on the outside of his gates which he says is to monitor his short drive, but in reality the cameras are pointing at my open plan drive and side on to my front door so that he can see my every move - is there anything I can do about this? What can l do when our neighbour has positioned a cctv camera on the upper wall of his house directly facing our house, bedroom, living room and garden. I'm having to keep my curtains closed. l asked him to move it. He said he would do it. But he still hasn't moved the angle to his own garden. What can l do ? CCTV i have cctv fitted on our property because football game on my street and damage to my wife car by neighbour kids.i made sure my cctv is register and i pay a fee every year. cctv is a very good thing in a neighbour wood,it made people think twice before they break the law,if one dont have notting to hide,then they wont worry a bout cctv. bellmust. We have recently objected to an oversized and overlooking outbuilding that our new neighbour is proposing. The local planners have yet to decide on this issue, however we have installed a new fence to limit being overlooked should the office/storage unit get approval. Today the same neighbour has installed 4 CCTV cameras (he does not reside at the property it is tenanted). The two rear cameras are clearly visible from our patio and our garden. I would suggest given their 180 degree capture they are capable of filming my entire rear garden and our coming and goings from our rear access and onto our patio. This feels somewhat in retaliation to our planning objection. Ultimately this neighbour will now remotely be able to monitor our own activity and coming and goings as well as his tenants. What would be the best way of tackling this? Hello. I am receiving police support over a harassing neighbour. I have footagecand photos of them being harrassing which the police are going to use for the Cps possibly. Now these nightmare neighbours have fitted a CCTV and correctly so but sit in their front doorway out of camera shot taking pictures of myself and my children and filming us when we are just going about our daily life. My issue is this if I film them on my phone doing this or take a picture of them doing this (as they live opposite me) I’m I doing something illegal if it is to prove what they are going? Hi all, I too have lived in an ex council flat for years without problems. However 2 yrs ago we had new neighbours who work from home and despite requests to stop the banging of heavy boxes. The problem escalated to using domestic noise to annoy me . Despite contacting the council and hoping for support i was targeted by the rest of the neighbours( some new residents moved in at the same time and have grouped together. I own my property and i have come to the conclusion there is no prptection for those that follow the law. I am targeted and seen as the problem for not tolerating her behaviour). This couple are on benefits and the council did decide to put recording equipment into my flat but they sent them a letter advising them. The neighbours have placed cameras up and i feel that whatever they do the council accepts. I am being forced out my flat by the majority who dont work and are claiming some benefit or other. The neighbours dont live under her so im really shocked at the conclusions being made. I own my property so i am proactive in raising issues if i was also having my rent paid maybe i wouldn't care either about what is happening on the estate. The council are not bothered about my health, the footage i showed about boxes being delivered has been met with contact the DWP yourself. This has been going on for 2 yrs. My neighbour is a child minder and has installed CCTV to monitor the kids in her front garden, I do not have a problem with that, however the camera on the side of their house that faces my house, has the camera pointing straight at my house, this became more evident yesterday when my grandson looked over the party wall to wave at the kids, and my neighbour came out straight away to tell her wards off for climbing up my wall to speak to my grandson, so the camera is clearly filming my property, my view is that the camera should be sited on the corner of their property facing back on the their own land, and not facing my house, am I being unreasonable. About 6 years ago,we got new neighbours next door,knowing this guy'sn reputation,i told him point blank,that i wasn't going to put up with his nonsense, " BIG MISTAKE ".Two weeks later they held a house warming party,which was a nightmare for my wife and i.I asked them politely to keep the noise down a bit," Politely" ,i was called all the names you can think of. They started setting smoke alarms off,etc.This behaviour went on until it was so bad,i got the police to stop it, " would've been better with a shotgun" However,eventually they were told by their Landlord to stop or be evicted. I was out one Saturdaywhen he took his temper out on my wife,and terrified her,so badly that she would shake when she heard his voice. They stsrted to knock on our doors,or bang on adjoining wall,to waken us up during the night. Him and his pal got banned from fishing a local Loch where i was a baliff, so they decided to force me or frighten me into giving them a permit to fish. After some arguing and shouting,i stepped forward,and can't remember if i hit him or not,but there was no blood from him,But,when he arrived at the police station to tell them,i was charged with Assault. Since then it's got progressively worse,my beloved wife,has gone into residential care,and i'm alone in this house which is bought and paid for. I thought they would think " He's got enough on his plate, "but no,they're not finished yet,this i know,and all this is over fishing. How can a person be so Petty ?. I live in an area of social housing where the majority of residents are on some kind of benefit and do not work. However they are surprisingly fit and competent enough to be anti social, have parties, arguments, drug deals, shouting matches, door slams, fight with other dealers, create damage and so on. I have reported their activities to the council, the local police where necessary, environmental health and so on. All that is ever done if anything is that they will log it and send a letter, maybe visit once a year. So basically they are just ignoring the behaviour and abuse of the system. Although I am shocked and disappointed at this response what galls me is the flagrant misuse of our tax payer money on people who do not deserve it and the tolerance of this from those in power. It is obvious that they do not want to go through the hassle of warnings or eviction because they have an easy cash cow. How do I get serious people involved to take action? My MP and local Benefit fraud agency do not respond either. Should I go to he Secretary of State? Hello, My neighbours son (who doesn't live there and is an adult male) has been prosecuted for indecent behaviour towards me however since this has occurred they had installed a cctv camera pointing down at their front door and drive way (I can only assume as an intimidation technique and to be annoyed at his prosecution) , this made me feel extremely uncomfortable as they were the ones who were in the wrong so I felt like why are they putting this up?! After a few months they've took it down but now it has reappeared directly across the street on their relatives house, so that they can aim it towards my house from across the street. I feel it's looking at my house and driveway so they can see as I enter and leave. What can I do that's not going to make the situation worse without having to be involved at all with them as they are horrible people I could not have a conversation with ? Thank you. I worry of ringing the police and getting them to check in case I'm wrong and it makes life harder. Thanks so much!! I've had cctv covering the front of my property drive and the road immediately outside my house where a second car is parked.It doesn't cover anyone else's property.If neighbours choose to park their car closer to my garden then the cctv will cover their car too.Initially I had neighbours calling me for it but as soon as one of their cars had damage they came running to me for footage. Of course I was glad to help and this seems to have calmed negativity. I have had problems with abuse from the neighbour directly near me and have checked with police on the legality of cctv with audio for my back garden where the neighbour puts his head over the fence to verbally abuse us.They have advised that this is fine as long as cctv is only covering my garden so I'm waiting on a 6 foot fence to be erected round the edge of my whole garden then will get the cctv up. I've asked police to inform them that I will be getting audio cctv not to catch them out but to prevent and deter future attacks. Our Neighbour has recently installed six CCTV cameras two of which are positioned on the top of hi property looking over all of the other residents gardens. He refuses to talk to any of the neighbors about these cameras. We live in a row of small two up two down terraces. We are all concerned that he will be recording footage of each family in their gardens. A number of us have small children. Several of the neighbors have contacted the police but the neighbour with the cameras has refused to let the police see what he is filming? Has anybody got any advice about what we can do?? The police can make the owner of the CCTV show them the footage. They can also check the siting of the cameras to ensure they are not invading others' privacy. So get back in touch with the police and ask them what they're doing about it. We think you can also ask for footage yourself under data protection rules...see this government page for more details. I have had a similar problem where my neighbour has installed cameras to the front and rear looking at our property.I didn't pay much notice at first but then she commented on stuff we do in our garden and also showed footage to othere when a theft occurred.This got me worried and I called west mids police on 101. A community support officer did come out the next day, but he was in a rush and done things very briefly. He told me that my neighbour had accidently put the cameras facing my property,but 3 days later 1 of them was still facing my property.I called 101 again and the cso has not updated anything on their system.I have now told them that I would like to make a complaint of harassment and they have called me for a interview tomorow. Lets see how it goes. Hi,my neighbour has at least 3 cctv cameras and one of them looks across my front door so she sees who goes in and out of the property. The camera also looks onto the public footpath I have checked on the ICO register and there are no cameras registered with them at that address 21/02/2017. She has inadvertently told me she has stored several recordings of me parking my car close to hers! She also complained that I park outside my own house to prevent her from parking there as its where the Camera looks.In my mind this camera is being used illegally and its an invasion of my family's privacy what should I do ? Contact your local Police or PCSO (non-emergency number 101). They should be able to go and take a look at the neighbour's CCTV and check where they're focused. Hi, my neighbour has at least 3 cctv cameras and one of them looks across my front door so she sees who goes in and out of the property. The camera also looks onto the public footpath I have checked on the ICO register and there are no cameras registered with them at that address 21/02/2017. She has inadvertently told me she has stored several recordings of me parking my car close to hers! She also complained that I park outside my own house to prevent her from parking there as its where the Camera looks. In my mind this camera is being used illegally and its an invasion of my family's privacy what should I do ?